MEA member Eva Menefee working with a student at Lansing Community College. Don’t let the word “free” lure you in too quickly, Menefee says. Consider alternatives before jumping into any college opportunity. That means educating yourself, she says. Menefee and others worry about issues that could trip up uninformed MEA members who sign up for the new member benefit – including credit transferability, financial aid limits, and online course and degree completion rates. At its April meeting, the MEA Representative Assembly passed New Business Items calling for MEA to communicate about these issues with members. “Students don’t know what they don’t know,” Menefee said. MEA’s program is run by an Ohio college with an out-of-state per-credit cost of $225, while Michigan community colleges cost about $100 per hour for in-state students. Does cost matter in a free program? Program participants must use all federal financial aid they qualify for, and Ohio’s Eastern Gateway Community College fills any gap. There is no cost for books. However, many people don’t realize that federal financial aid has lifetime limits both in terms of time and dollar amounts – meaning once a student uses up eligibility, that source of funding is gone, whether a student completed a degree or achieved a desirable outcome or not. 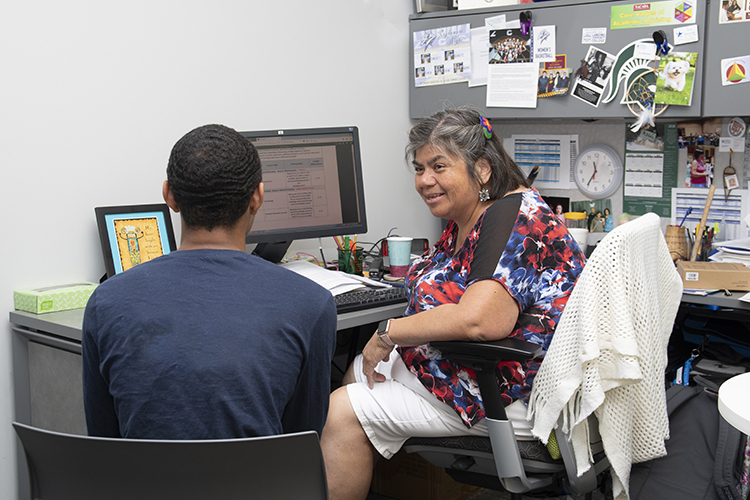 Students who attend college locally benefit from ongoing face-to-face advising. Academic advisors help students identify curricular majors to fit their interests, set completion goals, chart a path, and stay on track. That’s not even to mention free tutoring at student help centers. “Students who take on this opportunity to go to college need to make sure they have the network of support to help them be successful,” Menefee said. Another issue involves students who join the free college program and want to transfer later to a community college or four-year university in Michigan. Credits that don’t transfer from Ohio, or don’t meet degree requirements for the major, would cost students additional money and time. “If you’re not careful, you can end up having to take another whole year of classes,” said Matt Dunckel, a faculty member at Alpena Community College. All in-state public colleges and universities adhere to the Michigan Transfer Agreement, which was legislated in Michigan to guarantee transferability of general education courses between participating schools. She advises prospective students to fill out the Free Application for Federal Student Aid (FAFSA) so each higher-ed institution can determine how the federal aid offer will cover its tuition and fees. Then make an appointment at a desired college to talk with an advisor in person. Thanks for your article about the benefits of attending local community colleges. Many of our Michigan CCs are MEA, too, including two new unions at Northwestern Community College (where I work) and Southwestern Michigan College.